The Storm Sister is the second book in Lucinda Riley’s ambitious new series, The Seven Sisters. Based on the mythology surrounding the Pleiades (or ‘seven sisters’) star cluster, each novel in the series will tell the story of one of the adopted daughters of a reclusive millionaire known only as Pa Salt. Maia, Alycone (Ally), Asterope (Star), Celaeno (CeCe), Taygete (Tiggy) and Electra D’Aplièse have all been named after one of the stars in the constellation and have grown up together at Pa Salt’s estate, Atlantis, near Lake Geneva, Switzerland. The first book, which I read last year, is Maia’s story; The Storm Sister is Ally’s. The beginning of this novel is very similar to the first: the sisters have been informed of Pa Salt’s death and have all hurried home to Atlantis, where they find that their adoptive father has left each of them a set of clues which will enable them to discover the truth about their own origins. At first, Ally’s clues mean nothing to her: a small brown frog and a pair of coordinates directing her to a museum in Norway. She is intrigued but has no time to investigate because, as a professional sailor, she is preparing to take part in one of the biggest yacht races of her career. When tragedy strikes, however, Ally decides to travel to Norway where she attempts to unravel the secrets of her past. Following the trail left by Pa Salt, Ally learns of a talented young singer, Anna Landvik, who sang at the premiere of Peer Gynt more than a hundred years earlier. It seems that Anna’s story – and that of Jens Halvorsen, one of the musicians in the orchestra – could be linked to Ally’s own, but Ally is not quite sure what the connection could be. With the help of Thom Halvorsen, who tells her he is the great-great-grandson of Jens, Ally is able to fill in the gaps and in the process makes some surprising discoveries that will change the course of her own life. 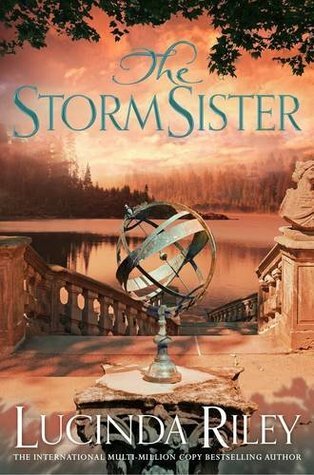 I enjoyed The Storm Sister but I think I preferred the first book in the series (I suppose in a seven-book series it’s understandable that I’m going to like some more than others). The Storm Sister is a very long novel and I think I would have been happier if less time had been spent at the beginning of the book on Ally’s sailing and her romance with her fellow sailor, Theo. It seemed to take such a long time for the historical storyline to begin! I did become much more engrossed in Ally’s story in later sections of the book, though; I loved the way things came together towards the end and the links between several different generations of Halvorsens grew stronger. The Anna and Jens storyline was fascinating and made me want to pause in my reading and listen to parts of Edvard Grieg’s Peer Gynt to help me imagine Anna singing Solveig’s Song and Jens playing the opening bars of Morning Mood on his flute. There is a musical theme running throughout the entire book and I was reminded of one of Lucinda Riley’s other novels, The Italian Girl, in that respect. As part of a larger series, I had hoped that this book might shed more light on some of the central mysteries. Who was Pa Salt? What were the true circumstances surrounding his death and burial at sea? And what happened to the seventh sister, who should have been called Merope? However, we don’t learn much more about any of these things in this book; based on the two that I’ve read, it seems that each novel will stand alone and can be read in any order – presumably until we reach the seventh book when our questions should finally be answered! Book three will focus on Star, or Asterope, and I’m already looking forward to it. Star is not one of the strongest characters among the sisters, but I like her and I think her story will be an interesting one. Thanks to the publisher for providing a review copy of The Storm Sister. I wasn’t sure that I wanted to get caught up with this series, because it meant seven big books and because it sounded a little too like an old-fashioned blockbuster, but I have to say that I am tempted …. Yes, I was of the same thought, 7 huge books, but once I read the first and was totally engrossed in the story I wanted to know each of the sisters history. Lucinda writes in a way that flows so easily and I have read these large books quite quickly because of her writing style. I have also listened to a couple of her other audio books and thoroughly enjoyed them. Thanks for commenting, Lynne. I’m glad you’re enjoying this series too – I agree that once you start reading, you can get through these books quite quickly. I think so far my favourite is Star’s story, but they are all fascinating reads.